My birthday is just around the corner and I am here to give all of you ladies a little tip. I'm not sure if it's because I bought something from them once or just hopped on their mailing list, but each year before my birthday, my good friend Tory Burch sends me an email code for $50 off anything online or in-store. 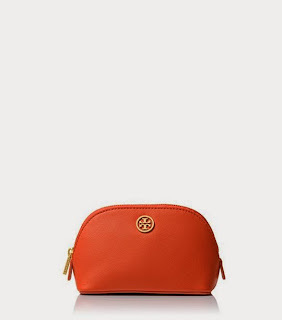 Now, $50 can get you nowhere fast with TB, but I always choose to pick up a cute little something (from the sale section usually) and thanks to Tory's generosity, it usually only costs me about $10-$15 out of pocket. and this year, I picked up this sporty little makeup bag, perfect for holding some odds and ends in my purse. What's cooking with you all? Any new fun discoveries to share with the class?